The Mercator projection of a world map. The angles are untrue for area, especially at high latitudes. Also note increasing distances between the latitudes towards the poles and the parallel lines of longitude. The only true world map is the globe. The Mercator projection comes from a globe inside a cylinder. The Mercator projection and its use on a world map. This projection first came into use in the 16th century by the Dutch. The equator is the circle that is equidistant from the North Pole and South Pole. It divides the Earth into the Northern Hemisphere and the Southern Hemisphere. Of the parallels or circles of latitude, it is the longest, and the only 'great circle' (a circle on the surface of the Earth, centered on Earth's center). All the other parallels are smaller and centered only on Earth's axis. The latitude of the polar circles is equal to 90° less the Earth's axial tilt. The latitude of the tropical circles is equal to the Earth's axial tilt. These circles of latitude can be defined on other planets with axial inclinations relative to their orbital planes. Objects such as Pluto with tilt angles greater than 45 degrees will have the tropic circles closer to the poles and the polar circles closer to the equator. Note that the features of the ellipsoid cross-section (orange) in this image are exaggerated with respect to those of the Earth. Elevation has an effect on a location with respect to the plane formed by a circle of latitude. 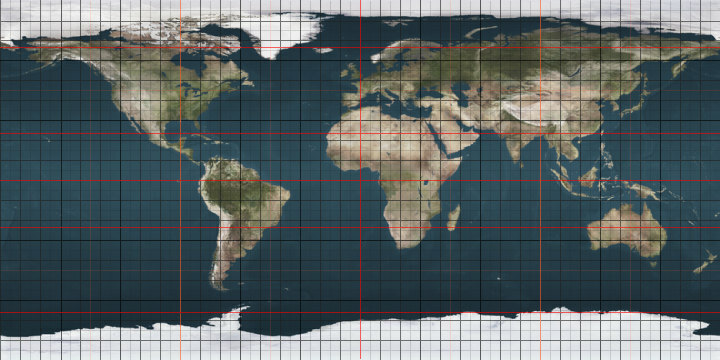 Since (in the geodetic system) altitude and depth are determined by the normal to the Earth's surface, locations sharing the same latitude—but having different elevations (i.e., lying along this normal)—no longer lie within this plane. Rather, all points sharing the same latitude—but of varying elevation and longitude—occupy the surface of a truncated cone formed by the rotation of this normal around the Earth's axis of rotation. ^ "''Trópico en movimiento'' (in Spanish)". Groups.google.com. Retrieved 2014-05-13. ^ "Maritime Delimitation between Nicaragua and Honduras in the Caribbean Sea (Nicaragua v. Honduras)" (PDF). Archived from the original (PDF) on 2015-09-24. Retrieved 2014-05-13. The 5th parallel south is a circle of latitude that is 5 degrees south of the Earth's equatorial plane. It crosses the Atlantic Ocean, Africa, the Indian Ocean, Southeast Asia, Australasia, the Pacific Ocean and South America. The 65th parallel north is a circle of latitude that is 65 degrees north of the Earth's equatorial plane. It crosses the Atlantic Ocean, Europe, Asia and North America. At this latitude the sun is visible for 22 hours, 2 minutes during the summer solstice and 3 hours, 35 minutes during the winter solstice. The 65th parallel south is a circle of latitude that is 65 degrees south of the Earth's equatorial plane. It crosses the Southern Ocean and Antarctica. At this latitude the sun is visible for 22 hours, 02 minutes during the December solstice and 3 hours, 35 minutes during the June solstice.